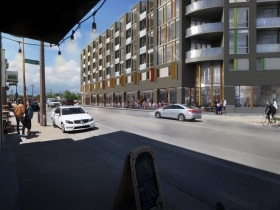 The Milwaukee Common Council unanimously approved a host of real estate projects yesterday. 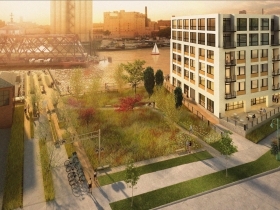 Included in the lengthy list were a new hotel tower in the Menomonee Valley, a new coffee shop for the East Side, a zoning change for an apartment building on E. North Ave., a new apartment building and plans for single-family homes in Bay View, a series of small changes to a controversial downtown building and a new park for the Historic Third Ward. The council had a number of projects before them because the meeting was the last one scheduled before the August council recess. 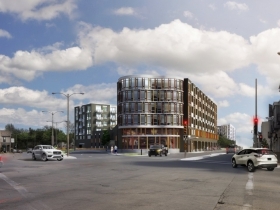 Zimmerman Architectural Studios president and CEO David Stroik presented the plans by the Forest County Potawatomi County to build a new wing onto their hotel complex in the Menomonee Valley at 1611 W. Canal St. to the council’s Zoning, Neighborhoods & Development Committee last week. The tribe is planning to add a 115,000 square-foot, 19-story tower with 119 rooms, including a number of suites. When complete, it will bring the total room count at the hotel to 500. 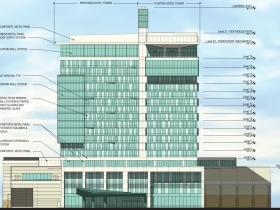 Also included in the plans is a 70,000 square-foot expansion of the casino’s convention space that will be located immediately behind the new hotel wing. Minneapolis-based Cunningham Group is leading the building’s design, with Zimmerman serving as the local architect of record. 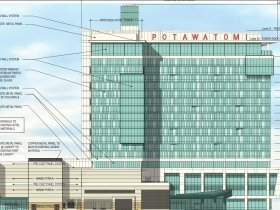 Potawatomi’s Greenfire Management Services will lead the construction of the project. 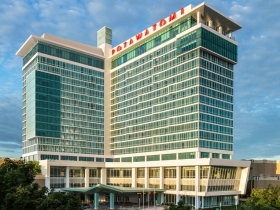 The hotel is expected to open in 2019. About the only question on the project at committee was offered by Alderman Russell W. Stamper, II asking how much the building would pay in property taxes (it sits on a fully assessed parcel, unlike the casino itself). Stroik said he didn’t have an estimate yet because the project budget was still being debated. The current hotel is assessed at $59,500,000 and had a $1.7 million property tax bill last year. For more on the project, see my recent coverage from the project’s hearing before the City Plan Commission. 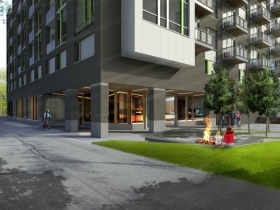 Stone Creek Approved for N. Downer Ave. 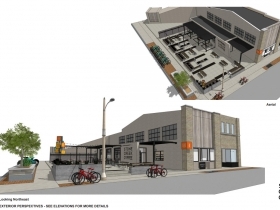 Nearing the end of a maze of approvals that would make any bureaucrat proud, Stone Creek Coffee co-owner and founder Eric Resch appeared before the zoning committee to present his plans to open a new 3,590 square-foot coffee shop at 2650 N. Downer Ave. The firm will redevelop the north end of the Mulkern Building. The building was originally built in 1912 as a commercial building with parking above. The building still serves the same purpose today, but the chauffeurs of yesteryear have been replaced by self-parking area residents. 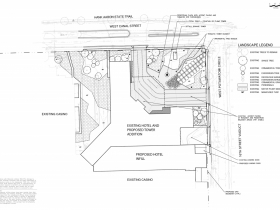 Resch is intending to reduce the area’s automobile focus and will be redeveloping the surface parking lot into a patio. Area Ald. Nik Kovac, who grew up just a block-and-a-half away from the site, praised the project. “It will be a landmark on the street,” he declared. 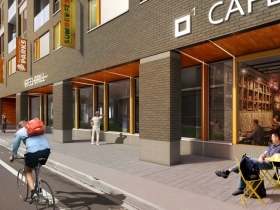 Groth Design Group is leading the design on the cafe. The project was previously endorsed by both the Historic Preservation Commission and City Plan Commission, each time unanimously. For more on the project, see my column from early July. Judge’s Tavern has been closed since 2013, but the building itself still sits empty along the E. North Ave. corridor. It appears the 1909-building will soon be razed. 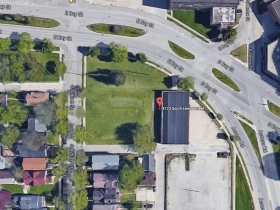 Developer Kalan Haywood and his firm Vangard Group secured approval for a zoning change on an adjacent duplex that would be demolished and incorporated into a development site with the former tavern at 1431 E. North Ave. Both properties are currently listed as being owned by an limited liability corporation affiliated with former Judge’s owner Michael Lee. In 2015 the properties were listed for sale for a combined $1,075,000. 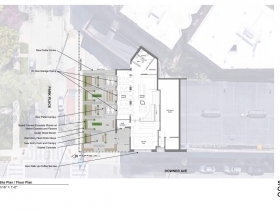 Vangard will still need design approval from the East Side Architectural Review Board. 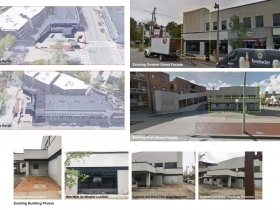 Designs for the building are not yet publicly available. 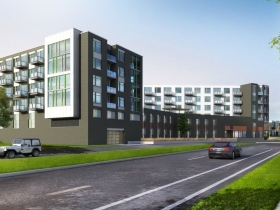 New Land Enterprises will redevelop the former Hamburger Mary’s site at 2130 S. Kinnickinnic Ave. into a six-story building with substantial first-floor commercial space and approximately 140 apartments. Korb & Associates is serving as architect on the project. Ald. Tony Zielinski is in favor of the development. Nearby property owners failed to file a certified petition that would require a 12-vote super majority to approve the zoning change. That wouldn’t have mattered as the project was unanimously approved, but not until after Zielinski introduced an amendment that many council members suspected was illegal. The amendment was ultimately withdrawn. For more on the Zielinski’s amendment and the project, see my coverage from yesterday. 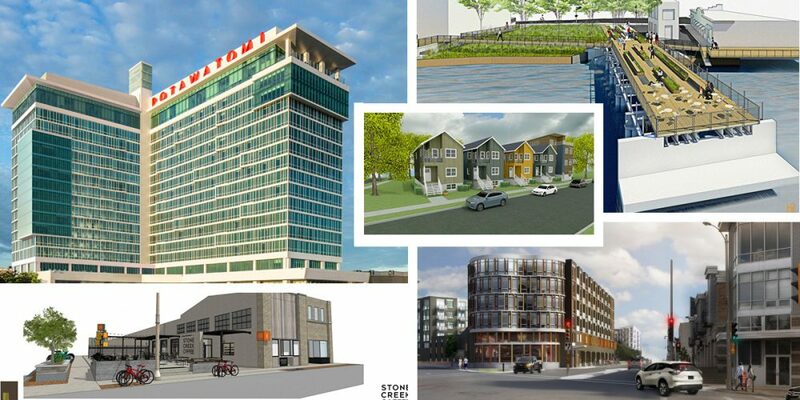 Another Bay View project got a thumbs-up from the council. 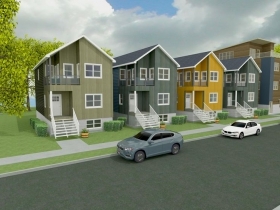 A plan for five single-family homes was approved. Developer Ryan Konicek had previously told the zoning committee that all of the homes are pre-sold, including one to himself. 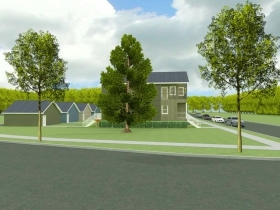 Konicek will still need to appear before the Board of Zoning Appeals to secure design approval for the homes. Renderings are for an earlier design iteration and the final versions are likely to include substantial changes. 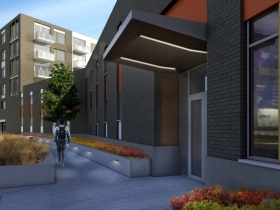 For more on the project, including how area alderman effectively killed a proposal to build an apartment building at the site, see my article covering the project’s hearing before the City Plan Commission. The Hammes Company, a health care real estate development firm, was back before the zoning committee last week. The firm’s controversial Jeffersonian-style downtown headquarters were originally approved for a vacant site at 210 E. Knapp St. in February. But a few more tweaks were needed to finalize the design. Originally intended to be a zinc-coated copper dome, the dome will now be a full copper covering given the parity in costs between the two materials. And an electrical vault owned by We Energies will be incorporated into the building’s parking garage instead of placed outside the structure. The firm is also modifying the motor court. A canopy will not protect those entering and exiting the building. The sidewalks will become a few feet wider and the turning radius will become a little less sharp. We recently profiled the project in our Friday Photos column. 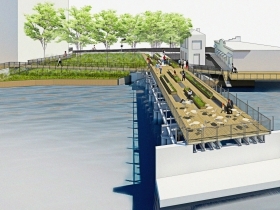 Milwaukee’s newest park took another step forward. 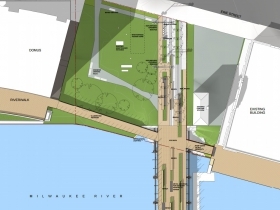 Trestle Park at 501 E. Erie St. in the Historic Third Ward will be developed on an empty lot and former railroad trestle along the Milwaukee River. The project will cost just under $1.2 million and be paid for using incremental property tax revenue from adjacent condominium and apartment buildings. The council unanimously approved funding and designs for the park. Work on the park is expected to get underway later this year and be completed in early 2018. 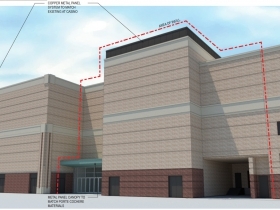 For more on the project’s financing read my July column. 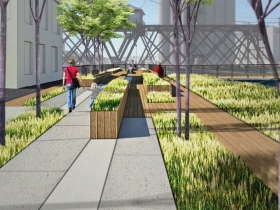 For more on the project’s design and its lofty comparison to High Line Park in New York City, read my June column. Milwaukee continues to miss two highly identifiable housing markets. Millennials are reported to be unable to afford a car and/or a house. Seniors. Both could be drawn to lower rent by stipulating they do not own a car (and plan to continue without a car). It may require a zoning change, to allow housing units without that rigid 1:1 ratio with parking, but there should be a market there. A test situation with a thoughtful zoning change, and an RFP would at least provide evidence of the possibility. “Millennials are unable to afford a car and/or house” is a myth. They won’t buy brand new cars, that’s what these reports are typically based on. As far as home ownership is concerned, the value in equity doesn’t mean as much to them/us as it did our parents. If you fail on your mortgage your booted out and your credit is shot for a decade. If you fail on a lease you can likely negotiate your way out or find someone to take it over before you get kicked out. Its a safer gamble. I always kinda laugh at the generational generalizations. It’s a marketing term and doesn’t take into account different ages (by some counts, 20 years of people) or economic status within that broad spectrum. Older Millenials (in their 30’s) are more likely to be able to afford a home, car, etc. Younger Millenials (in their early 20’s) are less likely to. That’s been the case for quite some time. There’s plenty of space for people who don’t own cars or prefer rental housing in Milwaukee, though public transport could be better. The real problem is there isn’t much incentive for people who want homes to raise a family in Milwaukee due to the perception/reality of poor schools and poor safety. That’s been the case for quite some time too. Anecdotally, friends of mine who have kids or are on the path to them, don’t even consider Milwaukee an option because of those two things. Couple that with an aging housing stock and higher than average property taxes and Milwaukee still has a lot of work to do. Thanks, Connor. I say yes to that, but the millennial “problem” with cars is many-leveled. The sheer cost per year works against any kind of long-range planning, owning a house is not a goal unless one is inclined to the burbs anyway. Owning a car has a lower value than starting a family (I applaud this priority). Car sharing is appealing – Uber, Lyft and the cab. Any combination of transit is going show show less expensive than the costs connected to owning a car – somewhere north of $500 per month. The older the car (with lower purchase price) comes with the likelihood of updating, repairing. Sam, Thanks. I hasten to make my own claim to information here. I do know folks to fled to the burbs. I also know folks who looked at specific schools in the MPS system and opted to stay. Generalizations about any “group” is not ideal, but that’s what developers do, they generalize and define markets with potential. Generalizations also tempt the phobic to run away from new ideas.